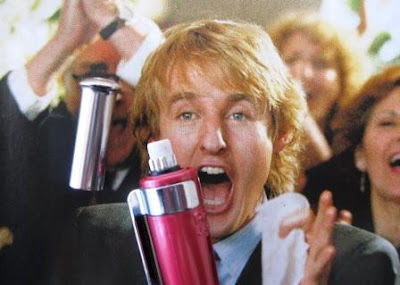 Well the Olympics are nearly upon us, so time for me to join the Olympic theme with a review of the S.T. Dupont Olympio. 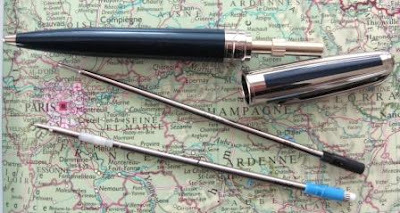 I guess Waterman would be the most well known luxury brand of writing instruments associated with France, but they are not the only one. S.T. 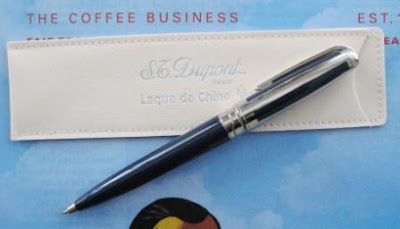 Dupont are a French manufacturer who started out in 1872 making luxury leathergoods, and they released their first pen in 1973. 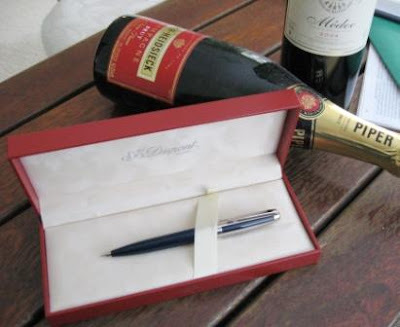 These days they sell leather goods, pens, lighters, eyewear, etc – a rather similar product range to the likes of Mont Blanc and Caran d’Ache. Firstly, despite the heading, this is not a multi pen / pencil ! Rather, most Dupont ballpoint pens come with a pencil converter cartridge, so you can load them up as either a ballpoint pen or as a mechanical pencil. But they can only be one the other at any one time, they only hold one cartridge, so you have to dissemble them and replace the cartridge to swap formats. My model is the Midnight Blue theme lacquer. The lower half of the body is fully lacquered, but the top half has 4 long rectangular panels of lacquer set into the metal. These panels are very well inserted into the metal surround, a seamless transition. Each panel is ¼ of the way as you go round the circumference of the body. I must admit to being unsure if the metal is platinum or palladium plated – the web just confuses rather than resolves the issue. Either way though it’s certainly a very nice bright shiny chrome/silver sort of plating. The midnight blue lacquer is very nice indeed. A deep dark dense blue - very midnight. Dupont seem to regard themselves as lacquer specialists, so this is the real thing, Chinese lacquer that started out as tree sap before ending up on my pencil. It looks rather like good quality plastic, but the feel is a bit different. Very smooth and shiny, but yet with quite a lot of grip. Great stuff. Dupont claim that lacquer is very hard wearing and scratch resistant – well I haven’t really put that to the test so, no comment. Overall I like the looks of this pencil. The geometric aspects of the inserted lacquer appeal to the engineer and art deco in me. I also like the styling of the central band in the middle between the two halves of the body. The various grooves and engravings all look good. ‘S. 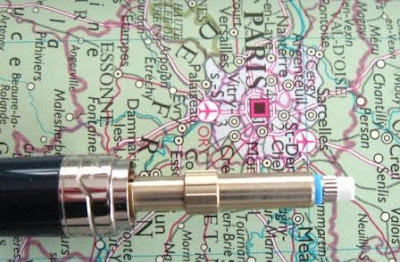 T. Dupont, Paris’ is engraved on the central band area. As you might expect, this pencil is heavy. It looks solid, like it should have a substantial weight in the hand, and it doesn’t disappoint. It will ker-thump down on your desk if don’t place it with care. 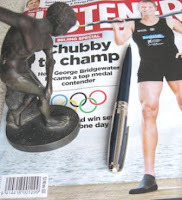 I always enjoy writing with a heavyweight pencil – every time you pick it up you are reminded of its presence. The balance is good, but perhaps a fraction top-heavy for my personal taste. The Olympio is a twist action ratchet lead advance mechanism. 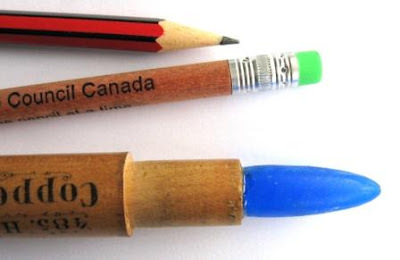 The whole top half of the pencil twists to activate the mechanism. The first twist of about 180 degrees advances the tip or lead sleeve out of the body. It ‘click-locks’ into position. Twisting back the other way will retract the tip. The tip is a small short conical sleeve and is obviously fully pocket-safe. Having advanced the tip, further twists advance the lead. Ten activations will get you about 6mm of the 0.7mm lead. The full range of the twist is still 180 degrees and the spring back is good and powerful. I found this 180 degree range of motion too much to comfortably operate one-handed. 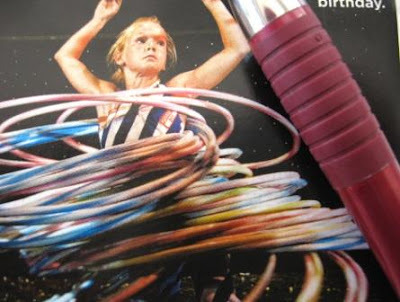 The lead actually advances with about 120 degrees of twist but you haven’t reached the stop position and can’t easily be sure what’s happening. Overall I would have to say advancing the lead is a two handed job, particularly if you don’t have good dexterity. Despite my earlier statement, a couple of times I did note that the spring back after twisting was a little laboured. Pulling the top off and on seemed to fix that. The top half of the body pulls straight off to allow access to the cartridge. There is a small emergency use eraser on the pencil cartridge. You can pull the eraser out to refill the lead cartridge. Dupont do not sell refill leads, just whole refill cartridges so I am surprised they allow this refill method to side-step their cartridge sales. You can buy both 0.5mm and 0.7mm cartridges so your one writing instrument can interchange between BP, 0.5 MP and 0.7 MP at will. Excellent. Photo: Top half of body pulled off and cartdridge removed. Two cartridges shown - pencil and ballpoint. 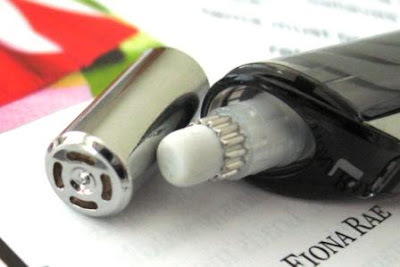 As you can see in the photo, the ballpoint pen refill is quite thin – more mini capacity than jumbo. The pencil cartridge has “Made in Japan” on it. The cartridges screw in and out of that long central tube with the spline halfway up it. The body top section push fits easily and securely back on. The pocket clip is a very nice spring loaded job. Very functional. ‘Made in France’ and a serial number are finely engraved on the side of the pocket clip. The Olympio comes in a very nice presentation box with lots of little booklets and a nice leather pen sleeve for protection when carrying it around. Best Points – BP/MP convertibility, sturdy looks don’t disappoint. Not So Good Points – see my comments above about the twist action. Dimensions – Length 139mm, diameter about 10mm in the main grip area about 12mm at widest point. Balance point about 80mm up from the tip. Note 1 - It appears the Olympio is also sometimes marketed as the Orpheo? Two names for one thing, no idea why. Note 2 – In a world awash with counterfeits it’s often hard to know whether you get the real thing or not when buying from anyone but an authorised dealer and paying a huge premium for that privilege. Maybe even that might not be 100% certain either. In my work I have some Asian suppliers who cannot guarantee anything. They buy the real brandname component X from the genuine authorised agent, but then scammers intercept the delivery truck and swap the shipment so you still end up with the counterfeit. It’s got so bad that some of the reputable ones just say, “No, we cannot quote you on the basis of using brand X componentry”. I did a bit of research on Dupont. Apparently there are plenty of very good Dupont counterfeits, the type that even experts have to take a careful look at, and are actually quite acceptable for the discounted but still expensive price you usually pay for them. Reading some articles on how to spot the counterfeits still leaves a few questions, as like all companies Dupont change things over time, models come and go, the articles don’t always agree with other, they are always about a different specific version to your one, etc. The articles did leave me with a nagging question or two – either I’ve got the real thing or a much better than average counterfeit. No point in loosing too much sleep over it though. I bought it several years ago from a long established reputable retailer. Done is done. I guess maybe though if I buy a Mont Blanc I might buy it from Mont Blanc rather than a very reputable pen retailer, because…well who knows…? I have always used the Staedtler Mars Plastic as my everyday eraser, and I don’t think there is any question that it is a very good eraser. However, since in my view Pentel dominate the world of mechanical pencils and mechanical pencil leads, it seems logical to give their erasers a try. Staedtlers history is with woodcase pencils, and I get the impression woodcase pencils are still very important to them, maybe more important than mechanical pencils, and thus I have always assumed that if there was any choice required they would optimise their erasers for woodcase ceramic leads rather than polymer leads. On the other hand I don’t think there’s any argument that Pentels mechanical pencils are more important to them than their woodcase pencils. Not to imply their woodcase pencils aren’t important, but their mechanical pencils are a worldwide force whereas their woodcase pencils are basically Japan-only. Thus I am tempted to think that Pentels erasers would be optimised for mechanical pencil polymer leads, should there be any conflict between eraser requirements. The Pentel Hi-Polymer ZES-08 measures 43mm long x 24 x 12, which is smallish by my standards and in comparison to the Mars Plastic. Surprisingly it is made in Taiwan. I don’t recall any Pentel mechanical pencils being made in Taiwan. 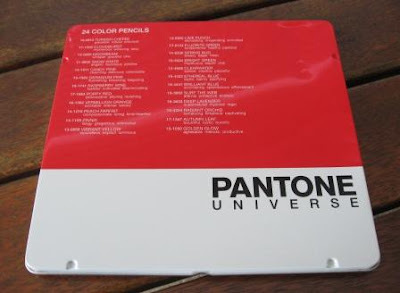 Like many erasers the Pentel Hi-Polymer has a sliding cardboard sleeve. 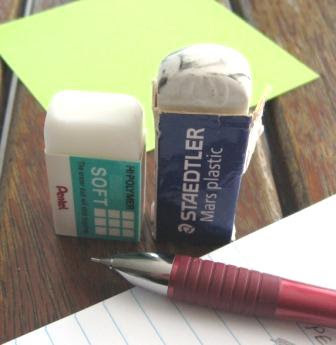 The eraser compound is white, and soft, noticeably a different white to Mars Plastic and definitely softer. Perhaps this softness might be an important consideration on thinner or more fragile papers, but in general use I found the softness a little annoying as it made the whole eraser flex and bend more when under pressure, and thus it felt a little less under control. As claimed, the eraser waste sticks together. I tried to compare the amount of waste produced and how well it stuck together with Mars Plastic but gave up. 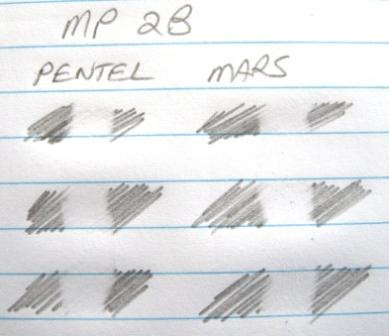 Too hard to be objective, but I am tempted to think the Pentel eraser wore down a little quicker than Mars Plastic. Time for some comparison tests. 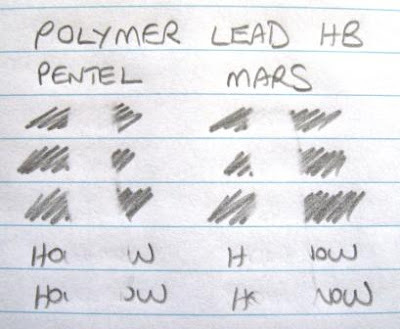 Below are 4 tests series, Hi-Polymer in comparison to Mars Plastic. 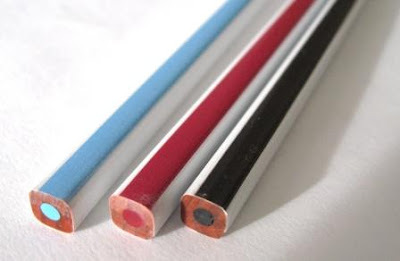 Mechanical Pencil polymer lead, HB hardness. 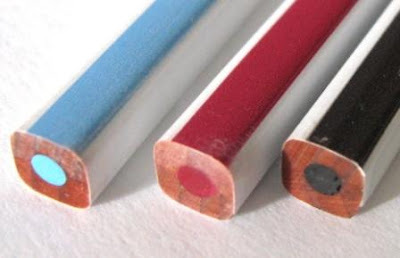 Mechanical Pencil polymer lead, 2B hardness. Woodcase Pencil HB and Mechanical Pencil HB. 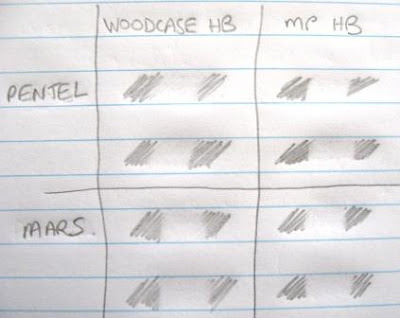 Woodcase Pencil 4B hardness. What did all that testing tell me? It told me that it’s pretty hard to tell these two erasers apart when it comes to erasing performance. Both do a great job on both woodcase and mechanical pencil leads. As expected, although still good, their worst performance was on the woodcase 4B lead. Smearing is always a little bit of a problem with such dark soft leads. This 4B test was the only one where I thought there was a little bit of a difference between the two erasers - it’s very close, but I did feel that Mars plastic did a slightly better job than Pentel Hi-Polymer on the 4B test. But very close, as I say. 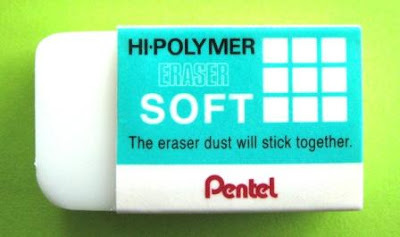 Overall then, the Pentel Hi-Polymer is an excellent general purpose eraser, a worthy competitor to Staedtler Mars Plastic. 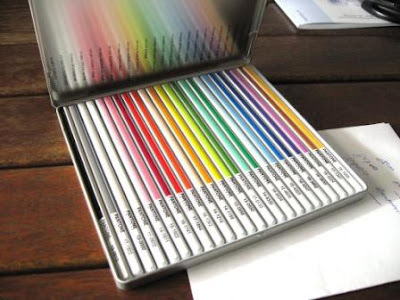 Thanks to those who helped with comments on the draft list of mechanical pencils with extendable erasers. I’m now publishing it properly, over here on my organiser blogsite. There is also a link in this blogs sidebar in the "General" section. My grandfather had a large collection of miniature bottles, and it is now in my possession. 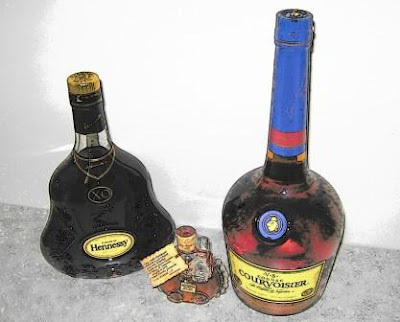 I really like them, and would like to keep collecting, but you know I’ve got this pencil thing going, so…........anyway, amongst my grandfather’s collection there’s no doubt as to which bottle is the premier piece. 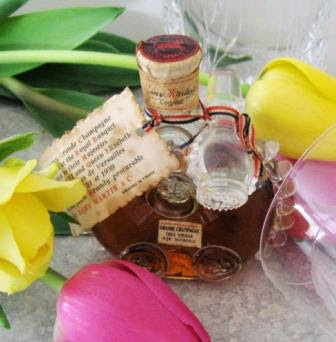 The decanter is handmade baccarat crystal. It stands 9cm tall and 8 cm wide (3½ x 3¼ inches). As you can see a small stopper and a label are attached by ribbon around the neck. The ribbon is red, white and blue – like the French flag (and the UK too!). 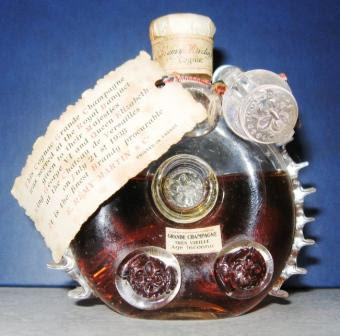 “This Cognac Grande Champagne was served at the Royal Banquet given to their Majesties King George VI and Queen Elizabeth at the Chateau de Versailles on July 21st 1938. It is the finest Brandy procurable. So, seventy years ago today, the big-wigs socked this stuff back. I imagine a Cuban or two was set on fire to help that cognac slide down. 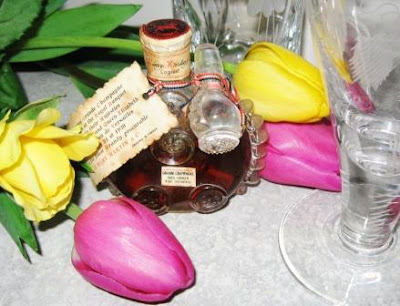 The small label on the bottle states “Tres Vielle Age Inconnu” which translates as “Very Old Age Unknown”. I guess the casks were so old that even back in 1938 their records had become lost or confused, so they were already many decades old, maybe even a century or more. One thing I like about many old advertisements is their emphatic statements of fact which are obviously totally subjective or just plain untrue. 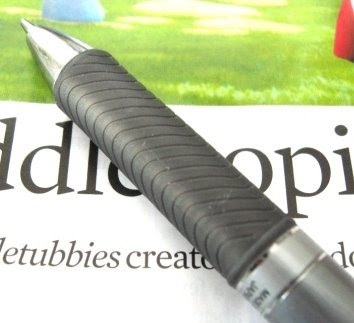 The number of old pencils and fountain pens that boldly proclaim themselves as the best in the world, totally eliminating writing fatigue, 100% leak-proof, etc is just mind-boggling. Somehow though, considering who this brandy was served by, and to whom, I am tempted to think that the bold statement “It is the finest Brandy procurable” might just actually be true. Whilst writing this article, I did a little research online and amongst other things found a very helpful Japanese collector of miniature bottles who had one of these bottles in his collection. He informed that on a good day, my little fellow in the middle might get me 30 or 40 of his normal-sized cousins standing next to him. 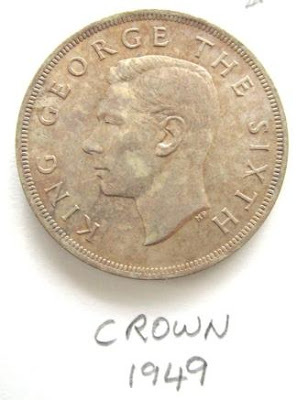 Technically the British Empire ceased a little before George VI came to the throne, but its dissolution was a slow thing, and thus in many respects he could still consider himself the sovereign of “an empire upon which the sun never sets” and his image was on official objects used around the globe. I don’t really collect coins, but I have a few passed down to me by family-members. 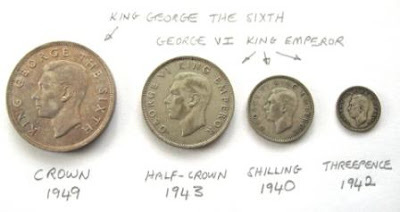 Since George’s brandy is worth a pretty penny or two, here’s a few images of George VI and others on penny or two. I’m afraid I only have relevant UK, NZ & Australian coins, so my apologies to those of you from places like the former Dominions of Newfoundland, of Canada, etc that your coins are not pictured. First up then, some New Zealand silver coins. When I say silver, this is back when there was still some attempt at having intrinsic value in coins, so there is a reasonable percentage of real silver in these coins. Note the change in his title after the independence of India and Pakistan (+Bangladesh), no longer an Emperor, just a King. Simple bronze pennies. From father, to son, to the son’s daughter. Three monarchs and three of their realms. Three faces of George, from the same three realms. Now, don’t worry my pencillish friends, there is a pencil link to all this, and we are finally here! 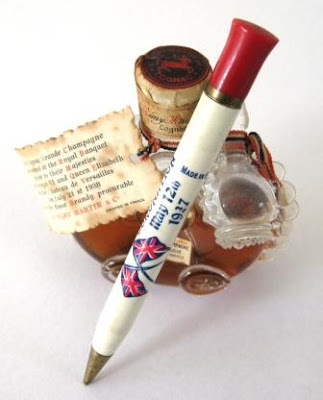 Look, a George VI Souvenir Coronation pencil. I bought it specially to go with granddads cognac. If I ever open the stuff, I’ll be sure to jot down some tasting notes with this pencil :-). This pencils in pretty good condition. Not much brassing. The printing is still good and clear – two UK flags and the wording “Coronation, May 12th 1937, King George VI. & Queen Elizabeth”, “Made in England” – although there is no indication of the manufacturer. It’s a simple twist mechanism. Despite all this royal stuff, I’m not really a monarchist, just a neutralist if there is such a term. But the royalty aspect does often make for an interesting angle on collecting things. Sunday night, just got home after an 8 hour drive, feeling a bit run down, getting some stuff ready for work the next morning, time to quickly choose a pencil for the coming week…well there it was, the EnerGize Pencil by Pentel. To make matters worse, Monday was the first day of the new financial year, so lots of reports to write…I was certainly going to need an extra dose of energy. Well, that was a couple of weeks ago back at the start of month, so now I’ve finally written this review and got it published. The Energize is a little bit of a change from the pencils I’ve been using lately. It’s a rather plain shape – basically just a long straight tube. No bulbous grips, tapering or curving bodies, etc. 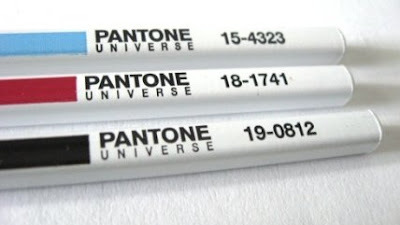 Instead Pentel have done a great job with the colour scheme. My silver-grey version really does look great – it’s simple, stylish, and yes, somehow energized looking. Picking it up, this pencil is lighter than I expected. I know it’s only plastic, but with all that metallic colouring I still sort of half expected a little more weight. As a lightweight pencil the balance is fairly neutral. As for the grip, well, it’s a rubber grip and we all know my opinions of those. Hold on, back it up, change the record - I am impressed with this rubber grip. This is one that gets it right. The surface is not slippery. The concentric wave pattern grooves feel almost like little flanges sticking out to massage your fingers and they do add to the grip. The compound has just that little bit of cushioning to it under finger pressure. This is the grip that other rubber grips aspire to be. This is a rubber grip that I do not object to – coming from me, that probably counts as serious praise. Well, that’s my opinion anyway. One strange thing did happen to my Energize. Twice the front section unscrewed from the body. That’s very strange for me and Pentel, but then the rubber grip does sort of make me twist and rotate the pencil around, so that was probably the cause of it. Giving it a little extra twist when tightening back up did finally cure this problem. The pocket clip is another piece of superior stuff. 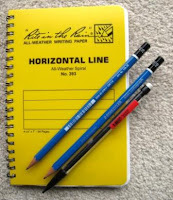 It is metal, good and sturdy, works well, and really fits in with the overall look of the pencil. See how the shape of the top of the body, and the graphics all lead your eye out to the pocket clip. 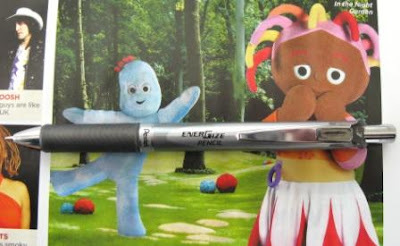 To me, everything about this pencil indicates that one day the Pentel design department assembled their “A-Team” and this is what they came up with. Get yourself one. Best Points – Lots, but I’ll single out the rubber grip again. Not So Good Points – I don’t want to put anything here. Dimensions – Length 150mm, diameter 11mm. Balance point about 75mm up from the tip. 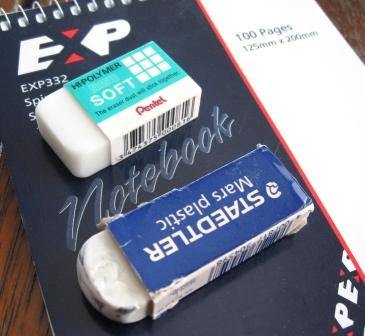 I'm compiling a list of currently available mechanical pencils with extendable erasers. Since I don't have or know of that many, I'd appreciate your assistance. I've compiled my draft list over on my sandbox play site, so if you you feel like helping please leave a comment over there. Thanks. I recently saw an auction for a rather weird pencil, and I bought it. From the markings on the case it appears to be an H & S brand number 485 Copper-Pencil, made in Germany. The case is wooden, you just pull the two tight fitting halves apart. The auction taught me a new word as the case was described as a treen case. My dictionary says treen = small domestic wooden antique. 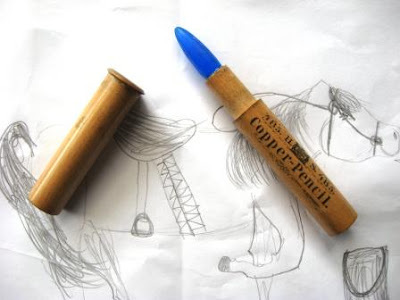 The pencil tip is a hard blue substance, quite a beautiful colour really. It doesn’t write though! A little bit of post auction web research has lead me to this conclusion – it’s a copper sulphate pencil, once used by doctors and vets to burn flesh off their patients. Gaarrrrr ! The mind-boggles. Thanks to the long term harmful effects of the local sun, I, like most Pakeha, am familiar with getting bits of me burned off by the doctor, but at least these days they use liquid-nitrogen which is quick and easy and usually only in the “sharp sting” rather than “serious pain” category. No manly stoic façade here, I just cringe thinking about this pencil being used to chemically burn bits off me. It appears copper is still used on horses, but I won’t be telling my pony-mad nieces about that. For humans the references I found for these copper pencils are mostly medical journals from the late 1800’s and usually in relation to treating conjunctivitis and other eye-infections. 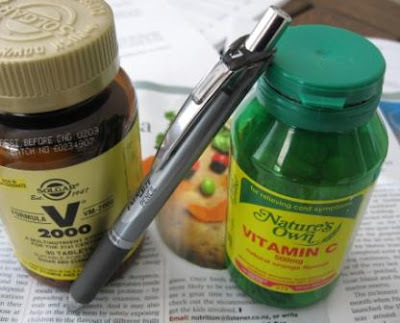 Apply the pencil to the eyelids to burn off the infected and granulated flesh. They ain’t kiddin’. Here’s an extract from the memoirs of a British doctor in the Near East in the late 1930’s. It seems eye infections were extremely common amongst desert peoples. Never let the facts get in the way of a good story. Well, I don't really know what it feels like to have a copper pencil used on you, maybe it's not all that bad, but the whole concept just seems painful and wrong. Copper sulphate isn't generally in the same nasty league as things like sulphuric acid, but I just don't see having a piece of 'the stone of hell' stuck in my eye as being an enjoyable experience. 15-4343 “Ethereal Blue” – idyllic, balmy, pacifying. 18-1741 “Raspberry Wine” – tasteful, cultivated, discriminating. 19-0812 “Turkish Coffee” – plausible, robust, practical. Don’t ask me how they sharpen, draw, erase, feel in the hand or anything. It's not as if I'm actually going to use them. Maybe lots of people will disagree with me, but I’m always somewhat surprised by how few Pentel mechanical pencils have retractable sleeves. Pentel really seem to prefer fixed sleeves on their pencils which is fine, but not so good for the general writer and their pocket. 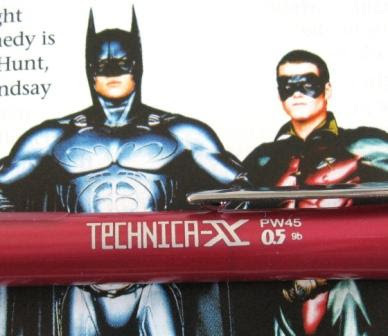 So, I thought it was time I got around to the Technica-X, a Pentel vanishing point pencil. Right, well let’s start with the mechanism, seeing it’s the main point for me choosing this pencil. Personally I prefer to call such mechanisms vanishing points rather than this crazy “double-knock” that seems to be gaining ground from, presumably, some Japanese mis-translation. Double-action would make sense, but double-knock is just nonsensical. So, usual story with such mechanism – the first push on the push-top button advances the whole tip section out of the body and locks it in place. Subsequent light pushes activate the ratchet lead advance mechanism, 10 clicks will get you 5mm of lead. A heavy full push releases the spring loaded system to retract the whole tip section back up inside the body. Great stuff. The ultimate in pocket safety and lead sleeve protection. In this case the lead sleeve is a thin 2mm tube. There is a fraction of play in the tip section so those who cannot stand any lead wobble and value super-precision should probably not purchase the Technica-X. But really, it’s only a fraction, unnoticeable in normal use. The push top ratchet lead advance is very nice and smooth. I’m sure the marketing folk would be saying something like “New improved super-smooth easy-action”. Hmmmm, almost too smooth and easy. I actually had a little trouble with being too heavy handed and thus retracting the tip when I only wanted to advance the lead. Still, you get used to such things, and I don’t really want to detract from my overall very favourable impression of this vanishing point mechanism. Right, well that’s the mechanism. What about the grip? It’s a fairly standard sort of rubber grip. A medium hardness compound so there is the tiniest fraction of movement under hand pressure. The grip diameter is a little on the wider side of average. There are concentric grooves to improve the grip. (?!?) As with many rubber grips, I am unimpressed by the surface of the rubber feeling slightly slippery, almost as if it has some oil or silicon on it. I note that a long finger-like part of the rubber grip moulding runs up the main body This doesn’t appear to have any purpose and makes me suspect it’s simply covering up something – like the slot where a side clicker button would go. I was intending to do some comparisons with my other pencils and see if the PW45 main body was the body of some other pencil, but circumstances have conspired to scotch that idea. So, if you happen to do the comparison, let us know. 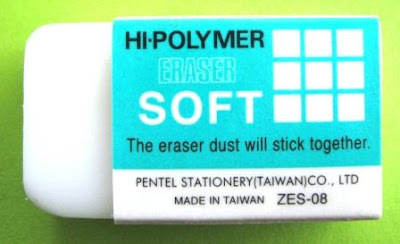 The usual “occasional-use only” small eraser is found under the push-top button. You remove the eraser to access the lead magazine. It is difficult to put the top-button back on without operating the lead-advance mechanism. The pocket clip works well. It slides easily onto a shirt pocket, and off when required. The tip of the clip is clearly a bit better than many similar tips that are simply folded under to make the clasp. In the hand the overall feel of the Technica-X is quite good. It’s a got a little more weight than most similarly sized plastic pencils and the balance is good. I quite like the smooth flowing shape of the overall look. Smooth and streamlined. Markings on the body are “Pental Japan” moulded in at the top of the body, and “Technica-X, PW45, 0.5, 9b” printed on the body. The “9b” is very small, and I’ve got no idea what it signifies. Bearing in mind the price range this pencil fits into, it’s a pretty good score. With this in mind I’m surprised Pentel USA only offer it in 2 versions - 0.5mm red body or black body. Does this imply it’s not a great seller? Best Points – Vanishing point. Not So Good Points – Not much really - the rubber grip? Dimensions – Length 13mm, diameter 11mm at widest part of grip. Balance point about 60mm up from the tip. It’s finally happened, I’ve joined the real world and upgraded to broadband internet access. Yes all this time I’ve been running this blog and surfing the net on dial-up access. Having written a typical mechanical pencil review in MS Word it’s then usually 30 to 60 minutes to upload it to Blogger and paste in the photos. Hopefully speedy internet will halve that. Of course the (so called) broadband speed I have, and the price I pay, would get my ISP prosecuted for fraud and racketeering in most countries, but that’s they way things are down here. At a time like this it’s good to keep ones feet on the ground and recall where it all started. Just in case you haven’t already seen this, here’s the oldest known pencil in existence. I found a parcel in my letterbox the other day. I’m not sure what I did to deserve it, but Stephen from Pencil Talk sent me some Musgrave, FSC Canada and Papermate Canadiana Naturals wooden pencils. I haven’t seen any of these before so it was good to get them. 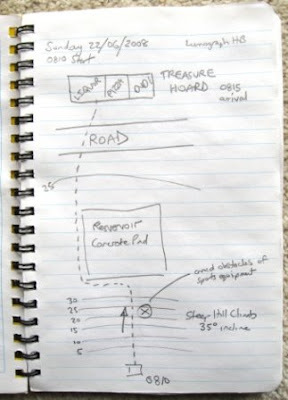 However, the main contents of the parcel were four notebooks. 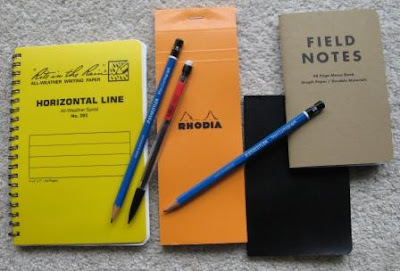 A small black ‘Moleskine’, a brown ‘Field Notes’, an orange ‘Rhodia’ Bloc No 08 and a ‘Rite in The Rain’ No 393 All-Weather Spiral. Fantastic stuff. I’ve seen Moleskines locally for astronomical mind-boggling prices, but the others I have only seen on the net and I don’t think they are imported down here. As indicated by my blog sidebar link to Black Cover I am interested in notebooks. I like that the Field Notes notebook has tick-boxes to indicate a ‘handsome reward’ (or not) for returning a lost notebook. 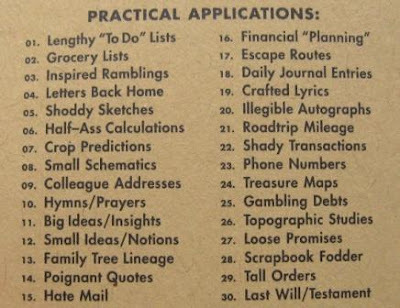 More than that though, the inside back cover has very detailed product specifications, and an excellent list of ‘Practical Applications’ for the use of the notebook. I do a fair bit of note taking out in the field for my bird studies, but it’s generally in fine weather. Telescopes and binoculars don’t work that well in the rain for the sort of work that I do, so I don’t really have too much trouble with wet notebooks. However, the Rite In The Rain is a most intriguing product and I couldn’t resist giving it a proper try-out. One of our recent former Prime Ministers described our country as “irreducibly pluvial”. The dictionary tells me he meant it rains an awful lot, so I only had to wait a few days for the weather report to include “frequent showers, some thundery and very heavy”. 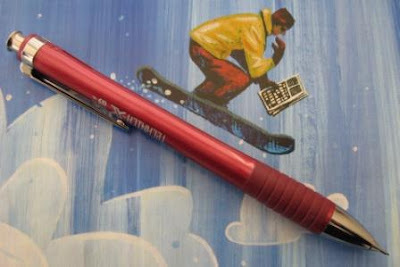 So it was on with my best raincoat, storm-pocket filled with a Rite In The Rain notebook, and three test pencils – Staedtler Mars Lumograph HB and 2B, and a BIC #2 mechanical pencil. I wanted to try different lead grades as well as ceramic and polymer leads. 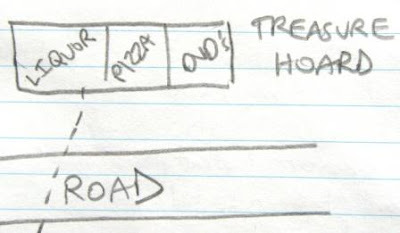 Taking inspiration from ‘Field Notes’, I decided on a route that would allow me achieve nine of their Practical Applications. Right, lets not beat about the bush, the Rite In The Rain is fantastic. It works. Period. Full stop. 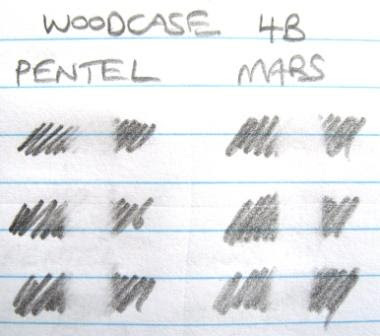 Woodcase and mechanical pencil leads both wrote as if the paper was dry. In a particularly heavy thunder shower I rubbed my hand all over the page so it was totally wet, and made sure I wrote through an unbroken film of running water. To all intents and purposes I was writing underwater, but it was basically just like writing on dry paper. Sorry about the state of handwrting, but I've got a good reason - driving rain, freezing wind, hands shaking, notebook balanced on my knee, etc, etc, etc. 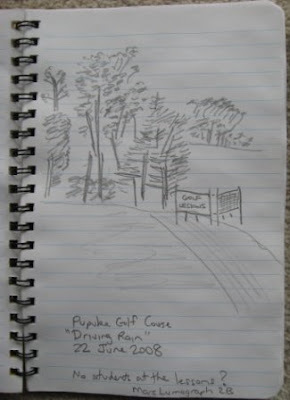 Here’s a quick 2-minute sketch of the golf course where I stopped. Note the absence of golfers at 8.30am on a weekend morning. It was driving rain on the tee rather than driving off from the tee. What I did notice though is that the paper did absorb water in from its edges. This became a bit of a concern with the spiral binding. All those square holes for the wire spiral make a lot of edges and I became concerned about the pages becoming soggy, weak and tearing out. I think I would personally look to use a stapled notebook rather than spiral bound because of this. Also the wet pages did tend to stick together a little. Still all this is minor stuff in the big picture. Pencil is normally pretty useless on wet or damp paper, but not on Rite In The Rain paper. I suspect erasability is a little reduced on dry paper, and out in the rain the difference between HB and 2B lead grades seemed reduced. Back home, I wasn’t sure how to dry out the wet notebook. I was a little surprised there was nothing printed about this in the notebook. I decide to blot off the excess moisture with a towel, and then put the notebook in the linen cupboard to air. The paper dried out reasonably unaffected although there is a little wrinkling. I checked the Rite In The Rain website but couldn’t find any drying instructions either, but one of the “User Stories” was an acquaintance of mine! The guy thrown overboard with his notebook on the way to Guam. So, get yourself out in the rain.